Can Invoice Factoring Save Your Business? Managing cash flow can be challenging for any small business owner. When the bills are due and your customers won't pay outstanding invoices until the last possible minute, any business on a tight budget can quickly get in trouble. If you don’t have a large enough cash reserve to cover your business bills while you're waiting to be paid and cannot qualify for a business loan, invoice factoring can provide a fast cash influx...at a price. Invoice factoring, also known as accounts receivable factoring, is when outstanding invoices are used as a financial asset to generate money for immediate needs. In essence, a company sells uncollected invoices to a third-party collector (called a factor) at a discount. Here's how it works: If you have outstanding invoices totaling $20,000, and you contract it out to a factoring company, typically the factor will charge a fee. Let's say it's 5%, or $1,000. The factor pays you 80% to 85% of the invoice amount less the fee, or $16,150. In addition, the factoring company may require a variable weekly fee, typically 1%, each week the invoice remains unpaid. When the customer pays the invoice, the factor pays the remaining balance, less fees, to the company. Let's say the invoice is paid in three weeks and the factoring company charges 1% per week, or an additional 3% total, for an additional $600. Your total fees, in this instance, add up to $1,600 on a three-week advance. The factoring fee, which also might be called the discount rate, is set by the factor, and will depend on several things. Higher invoice rates might merit a lower fee, especially when coupled with your customer's creditworthiness and your sales volume (which helps to determine the risk). The size of the fee will also be influenced by the type of business agreement you enter: recourse or non-recourse. An agreement with recourse means that you are ultimately responsible if your customer does not pay. In a non-recourse contract, the fact assumes the risk for a higher fee. Watch for added fees. While higher fees for companies with lower monthly revenues is to be expected, some factoring companies pile on the fees. Look for origination fees, checking your credit score fees, lockbox or service fees, ACH transaction or wire fees, monthly or weekly fees, or early repayment penalties. Shop around for the lowest rates and ask directly about fees, then read the fine print before signing. Invoice factoring should not be your first choice. While it can be a lifesaver during a short-term liquidity crisis, invoice factoring is not the best option for long-term financing. If your business can qualify for an SBA guaranteed loan program, interest rates can be as low as 8.3%, long terms, and low monthly payments. 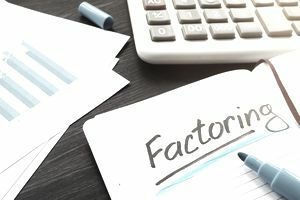 The factoring company takes over collections. You lose control of the accounts. Before you agree, make sure you know what tactics they use to collect accounts, or you may damage relationships with your customers. You may be stuck with the bill. If the invoice is never paid on a recourse factor contract, it is your responsibility to buy back the invoice or replace it with a similar account. Customer reliability matters. If your customers have a bad credit history, it may disqualify you for this type of financing. On the plus side, no collateral is required, factoring companies pay immediately, and it's often easier to qualify for invoice factoring than to secure business funding from a traditional lender. Invoice financing is a similar concept with a few significant differences. With invoice financing, your invoice is used as collateral for a loan. You retain control of the invoice and are responsible for collection activity. Like a traditional loan, you are required to make regular payments against the balance of the loan, regardless of when the customer pays the invoice. Much like invoice factoring, invoice financing can be quite an expensive option. Loans are usually short-term, from one week to 24 weeks. Interest rates vary wildly—up to nearly 70% APR. As with factoring, be sure to read the contract and understand the terms and fees. What Kinds of Businesses Qualify for Invoice Factoring? Factoring companies generally work with business-to-business (B2B) companies that invoice customers with short-term agreements (90 days or less). They may refuse to factor contracts with a longer payment term. Invoice factoring or invoice financing can provide a fast source of cash to keep your cash flow steady and your business budget under control. If you have bills to pay and can't qualify for a low interest business loan or business line of credit, this may be a good solution. In the long run, your best bet is to build credit and seek lower cost funding.